This 5 3/4 inch canister is the smallest of the Anchor Hocking American Greetings 1980 series. 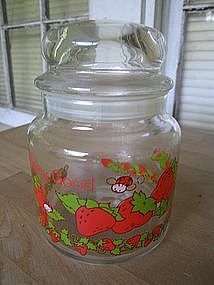 It has the original lid. One leaf may have a tiny dot of paint loss, but due to the way it was decorated, it is hard to tell if it is paint loss or just the way it was made. There is a tiny bit of wear to the date. I have the other 2 sizes of the set available for purchase and priced individually. I need your zip code to calculate the postage.